The rooms are great, with lockers, a nightlight and socket at your bed and even a curtain. But the bathrooms are small and steamy. 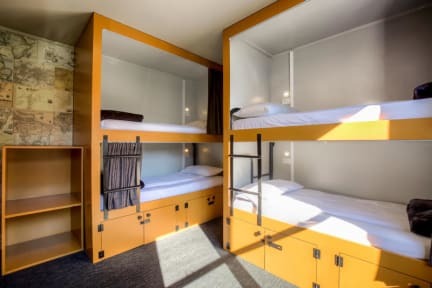 Quite expensive compared to other hostels in New Zealand. The location is fine, close to the centre. Nice bunks with your own outlet. The guy at the desk handled a big (annoying) group coming in very well! The biggest disadvantage was the small bathroom with one shower for ladies on the first floor, with no privacy at all. You have to get undressed while people are walking in. A real plus was that the location of the Black sheep was just outside the city centre so at night you don’t hear any loud music. The place was oké, but the showers are to small. Same for the toilets. It was built for asian people I guess. Staff is really Nice. When I arrived all toilets were either being cleaned or super gross. The morning after no hot water, but got a 15 minute window after 45 minutes of waiting. Dorm are awesome with privacy curtains and hostel located just outside the city centre so no noise! De verwarming in mijn kamer kon niet uit, terwijl het buiten ook warm was, waardoor ik amper heb kunnen slapen door de hitte. Daarnaast moet je borden en bestek enz bij de receptie vragen en als er iets weg is moet je betalen. Ook de locatie is niet heel goed.